Agricultural plants are one of the most frequently cited examples of genetically modified organisms1 (GMOs). Some benefits of genetic engineering in agriculture are increased crop yields, reduced costs for food or drug production, reduced need for pesticides, enhanced nutrient composition and food quality, resistance to pests and disease, greater food security, and medical benefits to the world’s growing population. Soybeans, corn, canola, and plums are approved commercial GMO products. Why can’t the latest advances in science be used to improve the health of humans? This post, “3 Benefits of Precision Medicine & How it Helps You,” shows the possible future of medicine. Genes are the building blocks of heredity. They are passed down from parent to child. They hold DNA, the instructions for making proteins. Proteins do most of the work in cells. They move molecules from one place to another, build structures, break down toxins, and do many other maintenance jobs. Sometimes there is a mutation, a change in a gene or genes. The mutation changes the gene’s instructions for making a protein, so the protein does not work properly or is missing entirely. This can cause a medical condition called a genetic disorder. You can inherit a gene mutation from one or both parents. A mutation can also happen during your lifetime. Single-gene disorders, where a mutation affects one gene. Sickle cell anemia is an example. Chromosomal disorders, where chromosomes (or parts of chromosomes) are missing or changed. Chromosomes are the structures that hold our genes. Down syndrome is a chromosomal disorder. Complex disorders, where there are mutations in two or more genes. Often your lifestyle and environment also play a role. Colon cancer is an example. Using Family Health History4: If you have a family health history of certain diseases, you are more likely to get that disease than someone without that family history. Knowing about your family health history can help you, and your doctor takes steps to prevent disease or find it early. In some cases, your doctor might recommend genetic counseling to help you decide whether to have genetic testing for a disease that runs in your family. What is family health history? Family health history is a record of the diseases and health conditions in your family. You and your family members share genes. You may also have behaviors in common, such as exercise habits and what you like to eat. You may live in the same area and come into contact with similar things in the environment. Family history includes all of these factors, any of which can affect your health. How can I collect my family health history? Why is family health history important for my health? 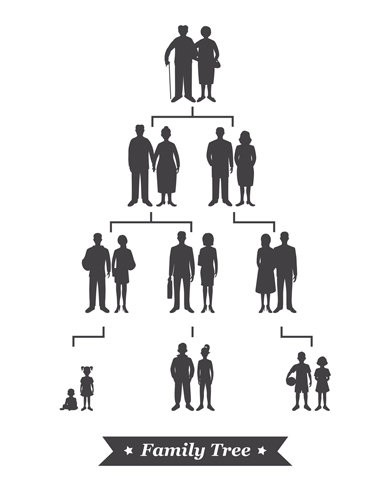 Most people have a family health history of at least one chronic disease, such as cancer, heart disease, and diabetes. If you have a close family member with a chronic disease, you may be more likely to develop that disease yourself, especially if more than one close relative has (or had) the disease or a family member got the disease at a younger age than usual. Collect your family health history information before visiting the doctor, and take it with you. Even if you don’t know all of your family health history information, share what you do know. Family health history information, even if incomplete, can help your doctor decide which screening tests you need and when those tests should start. Screening for Diseases Before You Get Sick: Currently, all newborns in the United States are screened for certain medical conditions at birth as part of newborn screening. Screening helps doctors find and treat these babies early, often before they get sick. Babies with certain newborn screening conditions need specific treatments, which can include following a special diet or taking medications. Tailoring Prevention: Most common diseases like cancer and heart disease are due to a combination of lifestyle and genetic factors. However, some people have inherited conditions that make them more likely to get a disease, and these people could benefit from targeted interventions. Women with a BRCA1 or BRCA2 mutation are more likely to get breast or ovarian cancer, and men with a BRCA1 or BRCA2 mutation have an increased risk for some cancers as well. People with Lynch syndrome are more likely to get colorectal (colon) cancer. People with familial hypercholesterolemia are more likely to develop heart disease at a younger age and to die from the disease. However, if you have one of these conditions which makes you more likely to get a disease, knowing about it can allow you to take steps to prevent the disease or find it early. These steps can include screening earlier or more often, taking medications, or surgery. The genes most commonly affected by hereditary breast and ovarian cancer are the breast cancer 1 (BRCA1) and breast cancer 2 (BRCA2) genes. About 3% of breast cancers (about 6,000 women per year) and 10% of ovarian cancers (about 2,000 women per year) result from inherited mutations in the BRCA1and BRCA2 genes. you inherit one of these mutations, you are more likely to get breast, ovarian, and other cancers. However, not everyone who inherits a BRCA1 or BRCA2 mutation will get breast or ovarian cancer. make them more likely to suffer from rare side effects from certain medications. Checking for these gene variants before you take one of these medications can help you avoid medications that could be harmful to you. All of Us: The All of Us7 research program, led by the National Institutes of Health, plans to enroll one million or more US participants, who will be followed for several years. All of Us participants will submit information about their medical history and lifestyle. Participants also may have certain physical measurements taken (for example, height, weight, and blood pressure) and provide urine or blood samples. All of Us will use this information to look at how genetic, behavioral, and environmental factors can affect health, including the likelihood of getting certain diseases and effectiveness of prevention and treatments. Learn more about how you can be a part of the All of Us program. 3 Benefits of Precision Medicine & How it Helps You 5 out of 5 based on 2 ratings. 2 user reviews.